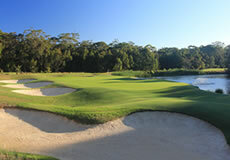 Officially opening in 1994 it was the first new course to be constructed in Sydney for over twenty years, at the time introducing a new system of membership ensuring the highest standards of prestige and exclusivity. Terrey Hills Golf & Country Club was planned and developed by Terrey Hills Golf and Country Club Holdings Ltd., a joint venture between Lansura Pty Ltd and Tokyo Dome Corp (both being experienced in golf course development), and Sanki Shoji Co Ltd.
Construction of the golf course involved the participation of seven companies, its advanced design and superb visual appeal created by Graham Marsh through Marsh Watson, a group with notable accomplishments in golf course design, both in Australia and overseas. 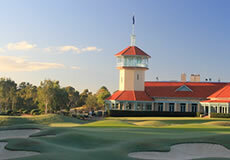 In 1989 the Terrey Hills Golf and Country Club was an artist’s impression, a model and a dream. 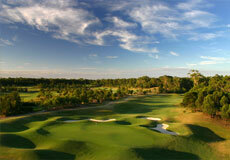 The vision of the developers has seen the construction of an imposing clubhouse and championship golf course. 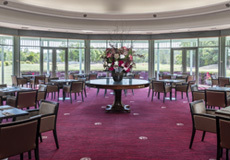 Every element contributed to the success of this project; the choice of location, the massive $100 million investment in developing the site part of which was once a barren quarry, the unparalleled standard of design and execution of the course, the magnificent clubhouse and the debenture style membership structure. Over the years it has developed into a dynamic club, building its own rich tradition and hosting premier events like the Canon Challenge, played at Terrey Hills on five occasions, and the Australian Women’s Open in 2003. Terrey Hills Golf and Country Club has met the challenge of breaking new ground, literally and figuratively, and now offers members significant ongoing personal and business benefits. The Club currently boasts a membership of 750 which includes leading Australian and international corporations and a private membership of Sydney’s elite.